After digesting last Friday's web stream of Concert for George, compliments of www.georgeharrison.com , on what would have been Harrison's 68th birthday, I've come away most impressed with the guitar work of Marc Mann-- as well as the sitar of Anoushka Shankar. 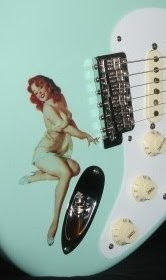 The guitar community was well represented, as was the Stratocaster. Eric Clapton, Andy Fairweather-Low, Mike Campbell and Marc Mann all played assorted Strats when not doing acoustic numbers. Also donning guitars were Tom Petty, Jeff Lynne, Dhani Harrison and Albert Lee-- last but certainly not least. But what about this Marc Mann fellow, and who is he anyway? I sure didn't know, though he certainly got my attention. As EC did his usual EC thing, and the others did whatever they do, Mann repeatedly stood out as the official torchbearer of George Harrison signature guitar statement. Tune after tune, this cat was nailin' all that trademark slide stuff and nearly every Harrison solo melody line ever ingrained in our hearts. In fairness, Heartbreaker Mike Campbell also threw down a near perfect Taxman solo. A web search of Marc Mann revealed very little of what I was seeking. No website, no discography-- none of the usual results one might expect for a top touring or session musician. In fact, most of the buzz about Mann online is about The Concert for George, which he incidentally assisted Jeff Lynne in the production of. The real results on Mann are to be found at sites like Discogs & IMDB where we discover his mile long list of scoring & arranging credits for motion pictures, and string arranging for other recording artists. Ah! So this his where this guy lives-- kinda like a Mark Isham, Danny Elfman or David Campbell of guitar. If you haven't seen Concert for George, there are random clips at Youtube. It is also available at Amazon on DVD & Blu-Ray. This show was a cut above typical tribute shows; a real mystical experience!